These words, spoken by Diana Macalintal, co-director and co-founder of TeamRCIA.com, set the tone for the two-day TeamRCIA Making Disciples Institute training session Aug. 10-11 at Savior Pastoral Center in Kansas City, Kansas. The training, hosted by the archdiocesan adult evangelization office, was attended by 75 RCIA team members, representing 22 different parishes in the archdiocese. Macalintal and her husband Nick Wagner, who founded and directs TeamRCIA.com with her, presented the training. 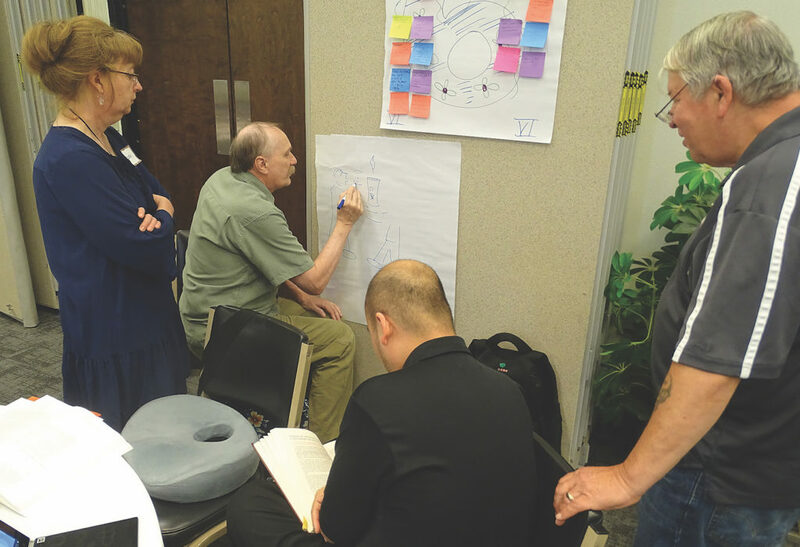 The institute training focuses on how to turn seekers into disciples and then how to use that process to bring seekers to the RCIA process, Wagner said. It teaches what the true vocation of a catechist is and how to live it out. The 22 parishes represented varied in size, with some teams comprised of only three people and others of 20; some parishes were fielding their first team and some had been established for several years. But they all had specific goals for the training. Rich Boynton, RCIA coordinator of Holy Trinity Parish in Lenexa, said he hoped his team would find a way to better meet the individual needs of each candidate. “Our candidates and catechumens have many different reasons for wanting to become Catholic — the reason why they make the first call,” said Boynton. “Furthermore, the starting point in terms of life experience and faith formation of those people is vastly different for each of them,” he added. Curtis Keddy, director of parish faith formation at St. John Paul II Parish in Olathe, said he hoped the workshop would clarify the role of the RCIA team to him. “The role of a team, in my mind, is to be companions on the journey of faith,” said Keddy, “encouraging candidates and catechumens as they follow in the footsteps of the apostles who left everything to follow Jesus. “My hope is that [the team] will learn that the RCIA is not a ‘course’ or a series of classes. It is an apprenticeship. Wendell Cline of St. Patrick Church in Kansas City, Kansas, has been on its RCIA team for five years. He and his wife Gayle, both converts themselves, wanted to find a way to change their role. Deacon Tim McEvoy, RCIA director of Immaculate Conception-St. Joseph Parish in Leavenworth, and Lauren Warthen, faith formation director of Divine Mercy Parish in Gardner, were hoping their teams would be able to see the ultimate reason behind the process. “I hope that our team will come away with an idea of the big picture — what RCIA is aiming at, how conversion is aided by the various parts of the process, how we can help others deepen their faith,” Deacon McEvoy said. “I hope people come away with a real understanding of how the rites should be done, what they mean and how powerful they can be,” he added. “I hope my team understands and is able to convey that conversion [means] being drawn close to Jesus and is the ultimate goal for both candidates and catechumens — not rushing through a process,” Warthen said.